I have a great fondness for New Orleans style piano solo, and it’s a nut I’ve been trying to crack for some time. It sounds very relaxed and natural, and not nearly as daunting as popular 20th-century forms like stride and rag. But the relaxed feel is very deceptive, because as I’ve discovered from a difficult-yet-not-impossible-to-find series of instructional books and CDs by the great Mac Rebennack, A.K.A. Dr. John, that feel masks a technique that demands accuracy, hand and finger independence, and stamina. I downloaded an mp3 of Allen Toussaint’s 2005 composition Tipitina and Me as part of a Salon Magazine sampler a few years back and simply love its sombre yet hopeful “post-Katrina” take on the New Orleans piano solo. I finally decided that I wanted to learn to play it, and after searching in vain for a transcription I decided I’d have to lift it myself. Lifting is like any difficult, time-consuming exertion; it’s something I’ll avoid if I can, even if I know it’s good for me. Even if I know it will make me a better person, which transcribing music most certainly will. But I figured my lazy self was beaten in this case, so I dragged the mp3 into the Logic arrange window and beatmapped it. If you’re not familiar with audio recording software, it’s going to be a little difficult to explain this. Just so that you know what’s going on, I’m trying to create the equivalent of tracing paper for music. But because computers think like metronomes and Allen Toussaint speeds up and slows down whenever it feels right to him, we have to tell the computer when to shift tempo and by how much. That’s what beatmapping is, in a nutshell. Then once this audio “tracing paper” is pinned into place, I can try to play along with the recording, and then tell the computer to turn my performance into notation, which I can then print out and play on an acoustic piano. I’m skipping a lot of steps here, but that’s the gist of it. Once I’d imported the mp3 though, it occurred to me that I had Celemony’s Melodyne Editor software. Melodyne is pretty remarkable, even now that it’s been around for 10 years. It allows you to transpose audio recorded material on a note-by-note basis, and in fact you can even adjust melodic curves and vibrato. This is a really nifty trick with monophonic (one note at a time) audio, such as a voice or wind instrument. And don’t confuse Melodyne with auto-tune. It isn’t real-time, and I promise you won’t be able to pick it out of a recording if someone doesn’t tip you off beforehand. Simply put, it sounds pretty amazingly natural. Well, so what. A piano solo isn’t monophonic. And if it was, who cares if we can shift the pitch, we want a transcription. Right? Okay get a load of this. 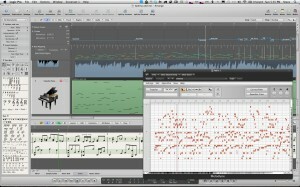 As of a few years back, Melodyne can handle polyphonic (more than one note at once) material. So you can record a polyphonic performance into your digital audio workstation, and then go in to the recording after the fact and start moving notes around. And once you know that, it doesn’t take long for you to realize that in order to do this, Melodyne has to know what notes are in there. Now if we can just get it to spit that information out, that’s exactly what transcription is – except I don’t have to do it myself or become a better person as a result. And, as it turns out, we can get Melodyne to export this information as a MIDI file, which we can then import into Logic, or better yet, a music notation program like Finale (one of those skipped steps I mentioned earlier), which can produce publishing-quality sheet music. I hope you’re excited now. Because I’m going to let you down. What Melodyne does is quite remarkable, in spite of the fact that it doesn’t spit out a perfectly typeset score, or anything close to it. But I used it to analyse Tipitina and Me, and what it produced is represented in part by the orange blobs in the image above (click for fullscreen view). Think of that as a kind of organic looking piano roll, with time on the horizontal and pitch on the vertical axis. It didn’t get all of the notes; it seemed to prefer the lower ones and missed a lot of the higher ones. In deference to the brilliant guys at Celemony, I haven’t really read the manual at great length. There are probably things I could do to improve my result here. But this is what I get out of the box with default settings. As you can probably hear, while Melodyne didn’t pick up all the notes, it seems to have lifted more than half of them – let’s say, conservatively, about 60% – and it hasn’t really given me any real clunkers. So this makes me think that home computer-based transcription is really just around the corner, by which I mean affordable within the next two or three years. I, of course, have seen the error and futility of my lazy ways (for the moment), and will return to my old-school elbow-grease method. But the Melodyne-generated MIDI track will definitely serve as a handy guide if I have any trouble picking out the left hand voicings. I’ll post the results when it’s done. Note: This article has been updated to reflect the fact that you can indeed export MIDI from the plug-in version, and not just from the standalone app, which did seem kind of odd in retrospect. Thanks to user redlogic at sonikmatter for pointing that out.